The following poem is by a 16 year-old Sophia. 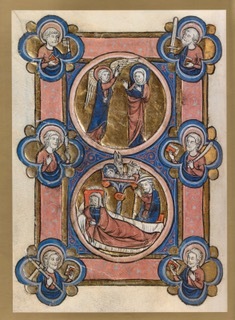 It is taken from Loose Leaves, the sequence of poems she wrote after seeing The Medieval Imagination, an exhibition of illuminated manuscripts at the State Library in Melbourne. Ours is a broken world. The battle against disorder, which (as is symbolised in Sophie’s poem) includes suffering and death, is fought line by line, poem by poem, thought by beautiful thought. Sophie loved Christmas, and would wish to give to others the deep meaning of it.